SUNRISE TO SUNSET VIEWS! Simply spectacular sweeping panoramic views from Thomas Mtn. to Palomar Mtn. and beyond. Situated on .44 acre bordering National Forest, this spacious ranch style home is filled with light and dramatic exposures in a flexible floor plan ideal for large family gatherings or separate living spaces. The spacious open beam great room has tongue and groove pine paneling and a floor to ceiling rock fireplace. A large kitchen with generous cabinet and counter space, opens to a bright dining room with wonderful views. The main level boasts 3 bedrooms, including a master suite with views and deck access, 1.75 baths and laundry room.. An interior stairway leads to a huge family room or potential 4th. bedroom , with wood stove and kitchenette area, a 3rd. bathroom (with shower), additional laundry hookups, a separate small studio room and exterior and deck access. There are huge, multi-level composite decks to enjoy the forever views and the private outdoor spaces overlooking the National Forest. 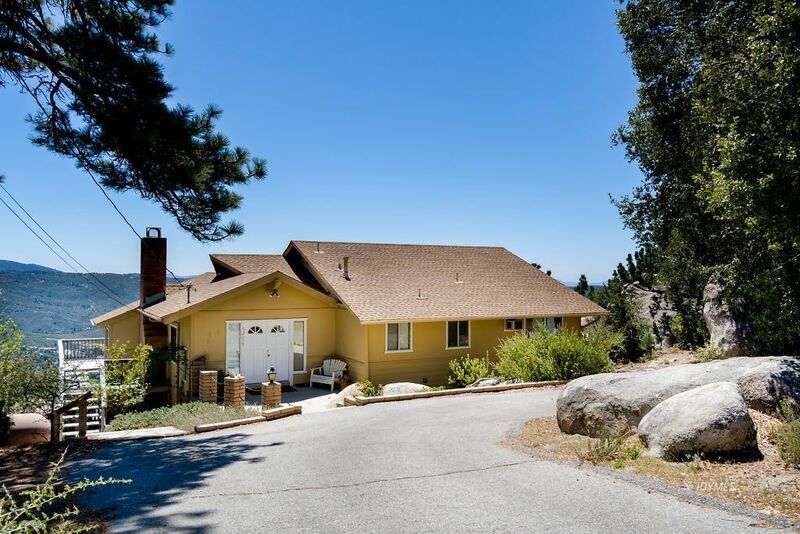 Located on desirable Double View Dr., this special property represents a unique opportunity to own one of Idyllwild's most coveted addresses.